UFC 227 estimated PPV buy numbers has been in, and it’s not bad at all as it exceeded the expectations. The promotion has a reason to celebrate this card. According to MMA Fighting, the early PPV numbers for UFC 227 draws estimated 300,000 buys that are highest the promotion has done for the majority of the year. UFC 227 Dillashaw Vs. Garbrandt event falls into the same range as the UFC 223 PPV event, which features Khabib Nurmagomedov vs. Al Iaquinta. With January’s UFC 220 event which kicks off the year and UFC 226 which went down this July, both cards didn’t perform well. UFC 227 PPV event went down in Los Angeles, Calif., back on Aug. 4, 2018, drew the largest crowd at the gate than any previous event held by UFC. 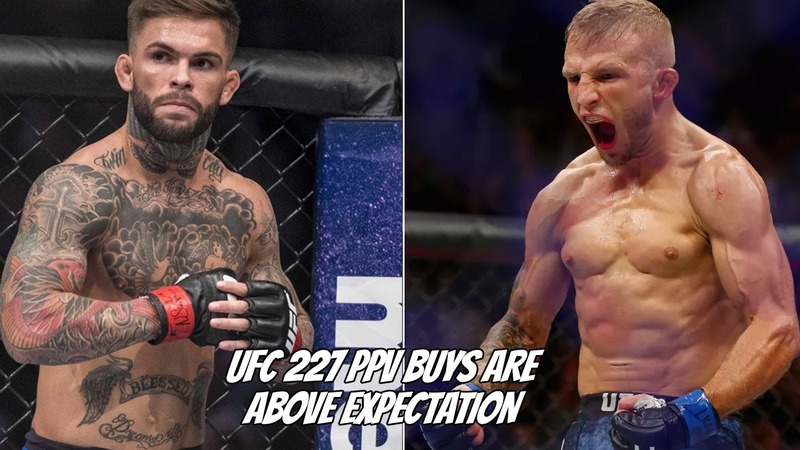 This event headlined by bantamweight rematch between TJ Dillashaw vs. Cody Garbrandt, Dillashaw went on to successfully defended the title after knocking out ‘No Love’ in the first round. In the co-main event, another history made when Henry Cejudo defeated the most dominant champion Demetrious Johnson via split decision to score the flyweight title. Historically the grudge match and rematches do well on PPV events. That could be the factor for this event to draw the highest number of PPV buys and most surprising fact it did well for fighters who never pull PPVs in the past including Demetrious Johnson and TJ Dillashaw as champions. It looks like MMA fans are finally showing some love to smaller guys. The promotion returns with its next UFC 228 PPV event on September 8 from the American Airlines Center in Dallas, Texas. It will be headlined by undisputed welterweight champion Tyron Woodley, who looks to defend his title against rising contender Darren Till. Previous articleVideo: Did a flying bat really try to attack Ronda Rousey on Monday Night Raw? Next articleReport: Before his UFC return is Brock Lesnar looking smaller?